Kids & Art Foundation collaborated with Art in Action to honor Childhood Cancer Awareness Month with a Wish Tree project. Kids & Art were invited to share the project with pediatric cancer in-patients at Stanford Children’s Hospital. We felt very honored and eagerly set up our tables, filling them with colored wools and pipe cleaners. All the staff were so welcoming and friendly. We sensed a very caring, loving environment despite the difficult circumstances. Participants gathered around the art table. The sight of the beautiful colored wools caught their attention and their young imaginations. We sensed the ‘pause’ button go on. We were full of admiration for the families who participated. We calmly began our introductions and simple directions with sensitivity to our surroundings and to their circumstances. We talked about favorite colors and the softness of the wools in the hope of making everyone feel comfortable and at ease. The abundance of wool proved to be soothing to touch and working with the wool had a meditative quality. The workshop turned into a friendly, supportive space which provided opportunity for not only a distraction but some creative expression. This is what we like to call the healing power of art. 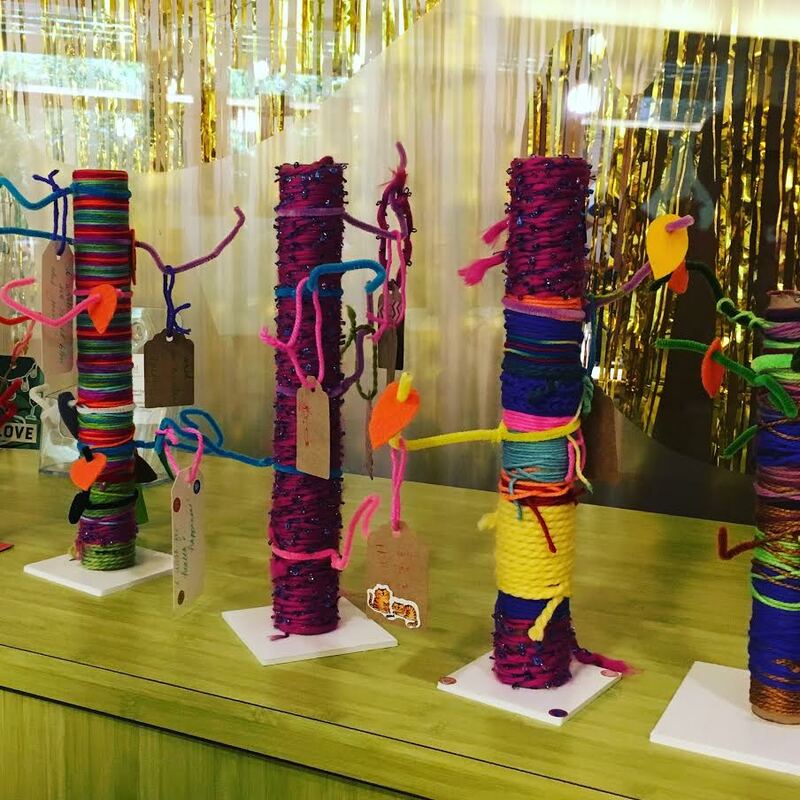 Each child created beautiful Wish Trees with multi-colored wool and branches made with brightly colored pipe cleaners decorated with felt leaves. When they were completed, it was time to hang tags that the participants had decorated and upon which they had written their wishes. We suggested they paused for a moment to acknowledge their wishes before hanging them on the tree. This brought smiles to each member of the family. It was at this point that we knew the time spent on the art project had brought some comfort to the whole family. All the Kids & Art volunteers agreed the project had lifted the children’s spirits. They seemed genuinely proud of what they had created and their precious wishes. The tree is their keepsake, a happy memory and a sign of hope. It was an honor to be able to play a small part in supporting these wonderful families during their journey through pediatric cancer. Kids & Art Foundation is thankful to have a vast community of artists who create with us. Our artists share their passion for art and their commitment to make the world a better place. Without them we cannot heal pediatric cancer through art. Caroline Robins organizes special projects for Kids & Art. She also serves as workshop manager at UCSF Benioff Children’s Hospital. She has worked in children’s art education for many years and has witnessed first hand the healing power of art. She feels honored to be part of this incredible organization which makes such a difference to kids and their families who have been touched by cancer. Caroline is also a member of San Francisco Women Artists and earned her BA (Honors) at Chelsea School of Art in London. She can be reached at caroline@kidsandart.org.